Alaska is home to so much natural beauty that it's impossible to see it all. 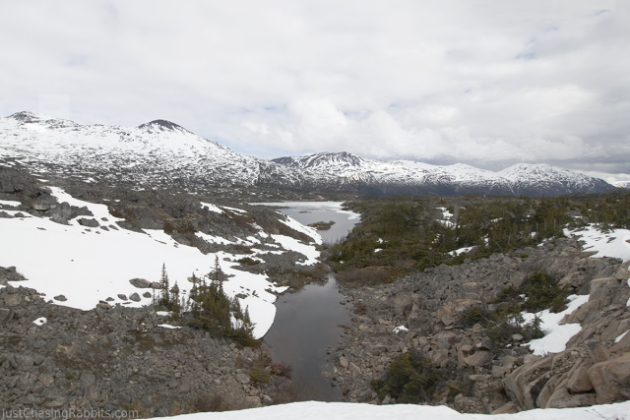 In order for us to see more of the countryside and really get a feel for the Yukon territory, we booked a trip on the White Pass & Yukon Route Railway, which runs from Skagway, Alaska to Fraser, British Columbia. Not only would we be seeing snow-capped mountains, untouched forests and creeks of rushing rapids, but we'd get to cross the border into Canada as well. Mark has previously visited the Toronto area, but this would be the first time I would set foot in Canada. On a train ride this beautiful, it was so easy to get caught up in looking that I had to remind myself to take photos! It's totally important to put the camera down and live in the moment, though. One lady onboard insisted on taking a photo of every mountain, every clearing and TRIED to get every waterfall. The waterfalls coming down off the mountains were often hidden in crevices and would only pop into view for a split second. This woman was irate, yelling at the conductor that there should have been some notice so she'd have her camera ready. Really? I barely had time to see them with my eyes! We split our time between sitting inside the train where it was warm and outside on the platform in the crisp air. Okay, the COLD air. The temperature wasn't freezing by any means, but the wind made it seem so much colder. Why would we go outside if there were seats, heaters and huge windows inside? Because the windows also had glares and reflections that we didn't want in our photos. After snapping a few photos inside the train, I quickly noticed my bright plaid shirt showing up in every one. Not exactly what I wanted in my Alaskan wilderness photos. Commentary could not be heard from the outside platforms, so we missed a good bit of the information about our surroundings. We bought a souvenir Blu-ray of the trip just to catch up on the bits we missed, and I got an awesome hat with it. Win, win. 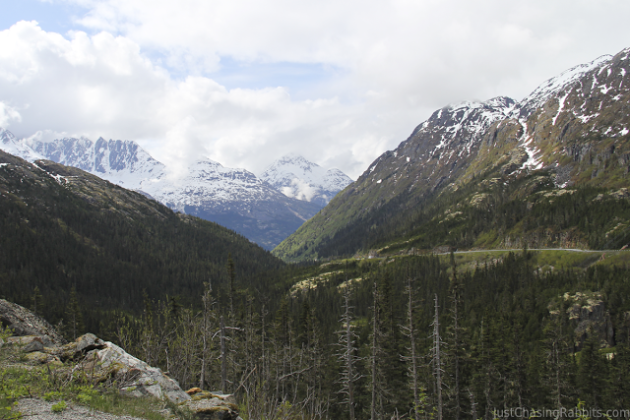 READ MORE: The Gold Panning Experience in Alaska: A Valuable History Lesson! The White Pass & Yukon Route railway was built in 1898 to serve during the gold rush, with populations rising in the area and freight needing to be shipped to and from the mines. Once our train reached Fraser, British Columbia, we boarded a bus for the ride back down to Skagway. 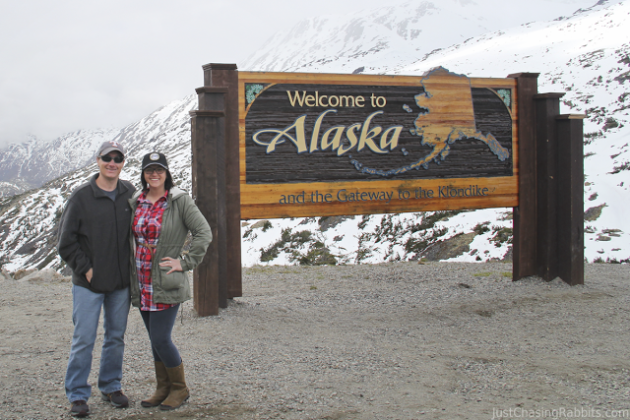 We made a stop at the "Welcome to Alaska" sign, which was such a great photo op. Before going back to town, our bus headed for another adventure at the Klondike Gold Fields. We were about to go panning for gold! Alaska has to be one of the most beautiful places to experience a train ride, so be sure to add this excursion to your bucket list! 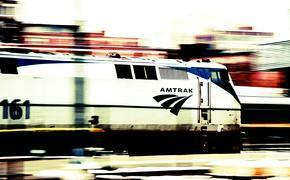 What's the best train ride you've ever experienced? 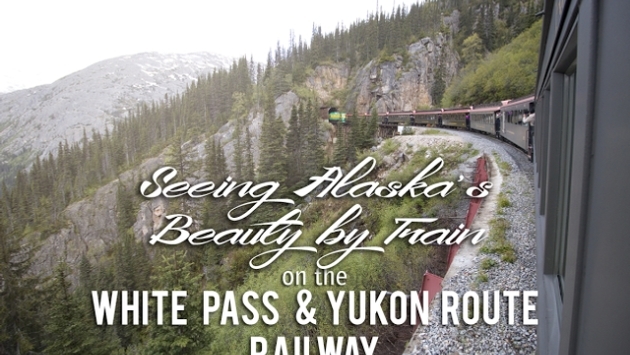 Have you seen Alaska or Canada by train? Do you think you'd like to travel by train? Let us know in the comments below! This story originally appeared on the Just Chasing Rabbits blog.